Successful selling is a transfer of enthusiasm, not a transfer of product knowledge. Sales tax reform may have new life, as a new bill has been introduced in the House that would level the playing field between brick-and-mortar stores and online sellers related to sales tax collection. A blog by the NBDA's executive director. 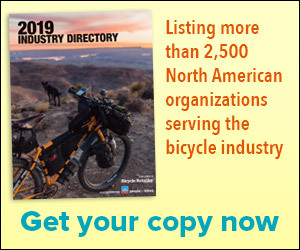 The number of bike shops continues to drop each year, but a new survey shows that several other dealer metrics are trending up. Members of Congress like to say nice things about small businesses in this country, but the track record shows it routinely favors big corporations. Innovation doesn’t come naturally to human beings, according to Stephen Shapiro, author and keynote presenter at this year’s Bicycle Leadership Conference. Mobile bike repair, e-bike dealers, and private label bikes are industry trends worth watching. Independent bike shops are an "essential component of the bicycle infrastructure that makes a community bicycle friendly," according to a March 9 resolution from the League of American Bicyclists. Internet competition, unfair supplier terms, high health care costs, and growing marketing expenses are the top challenges for independent businesses in several industries, according to a new survey released this month. By many measures, Shimano is one of the bicycle industry's great companies, consistently bringing product innovation and excellence to a willing marketplace. But from the perspective of many independent bicycle dealers in the U.S., Shimano has become a huge problem, choking the life out of them by supporting distribution that leads to rampant Internet discounting from Europe. Casual cyclists sometimes feel intimidated in bike shops because they don't understand the equipment, the complexity or even the people working there.